March 21th, 2018, Baltimore MD- An international team of longevity and deep learning experts working on the crowdfunded non-profit MouseAge.org project announce the launch of the MouseAge mobile application on the iOS platform to enable a community of researchers to contribute to the data collection and research. The MouseAge team is working on an exciting crowd-funded and crowd-sourced research project intended to develop the proof of concept for the deep learned photographic aging clock in mice. Development of a reliable biomarker of aging based on photographic images of mice has the potential to accelerate aging research and help identify new interventions that extend lifespan. We would like to address this need while engaging the broader research community, with the goal of offering a simple, freely available tool to anybody working with mice. The project is lead by Professor Vadim Gladyshev of Brigham and Women's Hospital, Harvard Medical School in collaboration with a large group of researchers working in longevity research and artificial intelligence from a variety of research organizations including Youth Laboratories, University of Copenhagen, Insilico Medicine, the Buck Institute for Research on Aging and many others. The group recently ran a successful crowdfunding campaign supported by over 170 donors from all over the world developed a specialized mobile app called MouseAge available for download from the Apple store. The app allows the scientists to take pictures of mice of different age and short videos that will be used for training of the deep neural networks. Even though there is a great degree of risk with the project and it might not be possible to develop the most accurate predictor of age using the many body parts of a large number of mice, in the case the effort is successful, the team plans to make the results public and publish a research paper describing the effort. Qualified researchers actively contributing to the project are expected to be co-authors on the research paper in the case of a successful project completion. The minimal quota for the co-authorship is 200 normal aging B6 mice for qualified scientists. "We are very excited to be launching the MouseAge photo app enabling the collection of the imaging and video database that will be repurposed for biomarker development once we train the deep neural networks on the animal data collected. 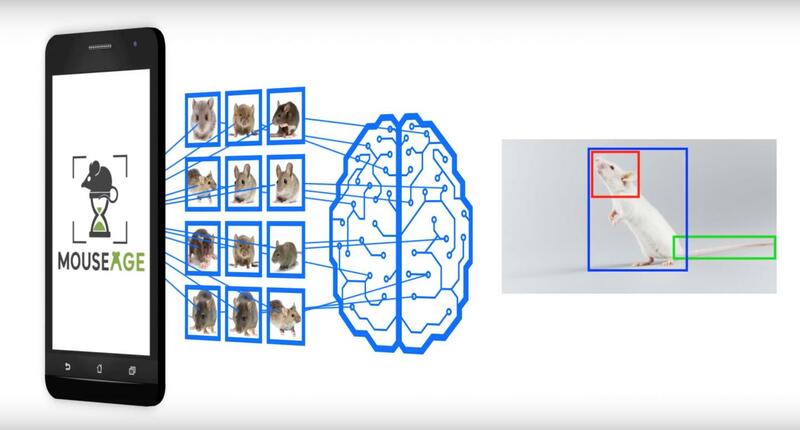 This database of pictures and videos of mice collected under a controlled set of conditions but at the same time in a way, which is easy to replicate in any laboratory anywhere in the world will be very important for the machine learning community. We will also learn to establish a set of guidelines and standards to work with these data types in other species including humans", said Anastasia Georgievskaya, the co-founder and managing director of YLabs.AI. Scientists working with C57BL/6 mice are invited to contribute images to the project. A collaboration would entail downloading the app and taking pictures of 200 normal aging B6 mice. US institutions may require IACUC approval to take pictures of mice and the collaborators are encouraged to request such a permission. Insilico Medicine, Inc. is an artificial intelligence company headquartered at the Emerging Technology Centers at JHU in Baltimore, with R&D and management resources in Belgium, Russia, UK, Taiwan and Korea sourced through hackathons and competitions. The company utilizes advances in genomics, big data analysis, and deep learning for in silico drug discovery and drug repurposing for aging and age-related diseases. Insilico pioneered the applications of the generative adversarial networks (GANs) and reinforcement learning for generation of novel molecular structures for the diseases with a known target and with no known targets. In addition to working collaborations with the large pharmaceutical companies, the company is pursuing internal drug discovery programs in cancer, dermatological diseases, fibrosis, Parkinson's Disease, Alzheimer's Disease, ALS, diabetes, sarcopenia, and aging. Through a partnership with LifeExtension.com the company launched a range of nutraceutical products. It also provides a range of consumer-facing applications including Young.AI and Aging.AI.